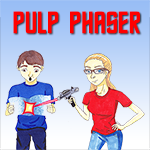 Welcome to Pulp Phaser. Every two weeks, Mike Gaines and Sunshine Reardon will take a look at the comic world of Star Trek. Be sure to follow us on Twitter (@pulpphaser)!